Since having a fall and suffering a stroke, I have been taking rose hip vital for 2 months, as prescribed. I have found great relief from the lower back pain and gained a general feeling of wellbeing as well as noticing less joint pain and inflammation. I would like to share my personal experiences of how Rose-Hip Vial has helped me. I had a swelling in my ankle for over 2 years which I showed to a GP and a specialist neither had any suggestions on how to cure or even alleviate this painful problem. After watching a program on TV I decided to try Rose-Hip Vital. Within a very short time the ankle swelling went and has not returned. I also had back pain when working in the garden  such as bending or racking. Rose-Hip Vital has given me relief from this pain and also improved my body’s general flexibility. I am again able to have the enjoyment of doing work in my garden. Thank you Rose-Hip Vital. In 2004, we purchased a Toyota Coaster bus which had been converted into a small mobile home. Our plan was to follow the sun for the four months of the South Australian winter. However with each trip, what had initially been a slight lower back pain became progressively more painful and our trips became shorter. I became dependant on pain relief, both internal and external, as well as anti- inflammatory medication and my doctor was talking “anti-depressants”. Normal activities such as placing food down for my dogs was an ordeal (a 4 year old told me that I looked like a giraffe drinking out of a puddle) Gardening, hanging out the laundry, washing floors would result in me being bed ridden for several days. There were times when the pain was so intense that my husband would have to assist me to turn over in bed. October 2012 was when I saw an advert for Rose Hip Vital and decided to try it, although it did seem expensive, THIS WAS A TURNING POINT IN OUR LIVES. I am now able to do all my own house work and a few hours gardening a week (gardening has never been a favourite of mine). We are planning a trip to Cooktown next winter. I am so pleased with my improvement that I am now going to trial the Rose Hip Canine product on my six year old Jack Russell/Heinz cross. Our Vet says he has severe arthritis as a result of jumping from the window of a moving vehicle when he was a puppy. I intend to keep a pictorial record over the next twelve months so that I can report on his results. I would like to express my opinion on your product, as I have found it amazing. I am a twenty eight year old plumber with a lower back problem that has been causing me grief for four years now. I have a slight disc bulge with what is described to me by professionals as neuropathic nerve pain. Not a nice experience to go through for anybody. I have tried many different things to try and solve the problem but nothing has really worked. I was given some medication by a professional to target the nerve pain component of my problem but have issues with heavy medications and basically refuse to take them due to all the side effects. Rose-Hip Vital was recommended to me by a naturopath in a health store. I was a little sceptical at first but after taking Rose-Hip Vital for three weeks, I noticed a MASSIVE difference in my pain levels. Not quite sure what component of the Rose-Hip is targeting my problem but it is working. I stopped and started taking the Rose-Hip just to see if it was my imagination or it was really helping. After a few months of this it is only fair to say that the stuff really works. I recommend the product to all. I’ve had arthritis for years, and now with degenerative discs in my back and neck as well as the knees being really crook. It’s made it extremely hard to keep up with everything in my day to day life. This includes gardening, so generally it’s an hour at a time then lay down and read for an hour, then I start again. So WOW! I did 4 hours straight cutting, potting etc. I was so pleased and all I’ve done differently is take Rose-Hip Vital capsules, so thank you. I have had a couple of products for my lower back pain and lately, both hips were painful when walking up stairs. When Elmore Oil didn’t work, I didn’t think any natural products would. I heard about Rose-Hip Vital, and thought that I probably wasting my money. What a wonderful surprise? Rose-Hip Vital has changed my life. I have rheumatoid arthritis and severe pain in my knee joints and back. 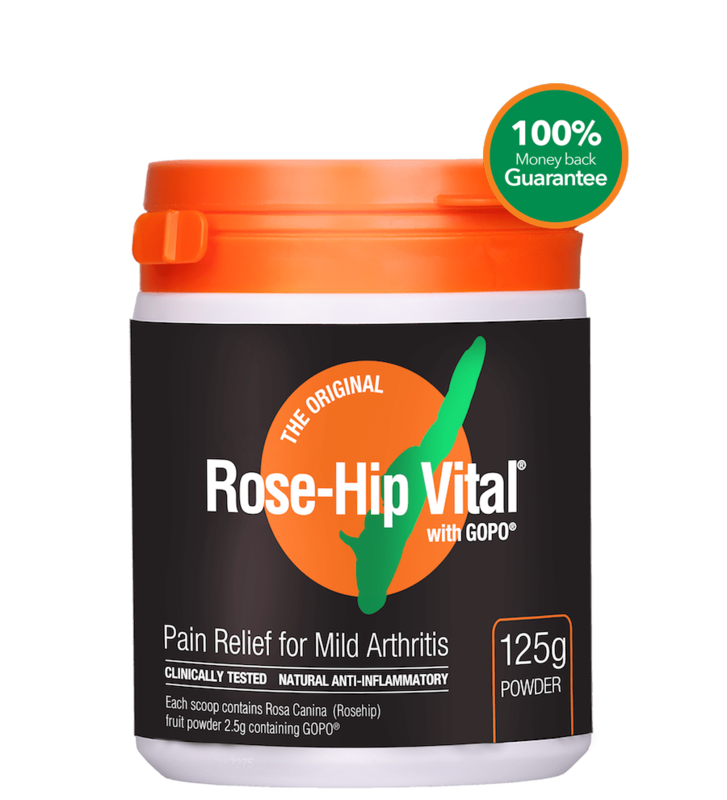 Taking Rose-Hip Vital has helped me dramatically in taking a lot of the pain away. I now routinely take it as a result. I am an ex carpet layer, dragging and installing carpet and vinyl all day, not listening to what your body is telling you when it hurts because the job has to be finished in time. I was told 25 years ago that if I would not slow down or stop, I would end up in a wheelchair. Who believes that when you feel good with a bit of back pain sometimes? I stopped laying carpet when I turned 55 but still built our home in my own time and with help of a very good neighbour. Now after the latest CT scan, the doctor told me there wasn’t a normal vertebrae in my back and that I had osteo arthritis. I was prescribed anti-inflammatory. After a while, the problems started. I had tummy ache, not concentrating, not seeing properly and was irritable etc. Now from anti-inflammatory to Panadol osteo but I only use half of what the doc tells me. To fill to my own feeling, I use your Rose-Hip Vital and it seems to work. I use capsules and or in powder form. I will never be 100% but with a bit oft the same back pain sometimes as in the old days I am very happy. My name is Rebecca and approximately seven years ago, I sustained a severe back injury from a Horse Riding fall. I have struggled on and off with recurring pain and back spasms ever since. After seeing personally the amazing results that Rose Hip Vital gave our Blue Heeler Sasha and hearing many testimonials from people that had used the product, I thought I would give it a try. I have now been on Rose Hip Vital for eight weeks and have noticed a huge difference. I am not getting as many pain episodes as previous and I am sleeping a lot better at night. 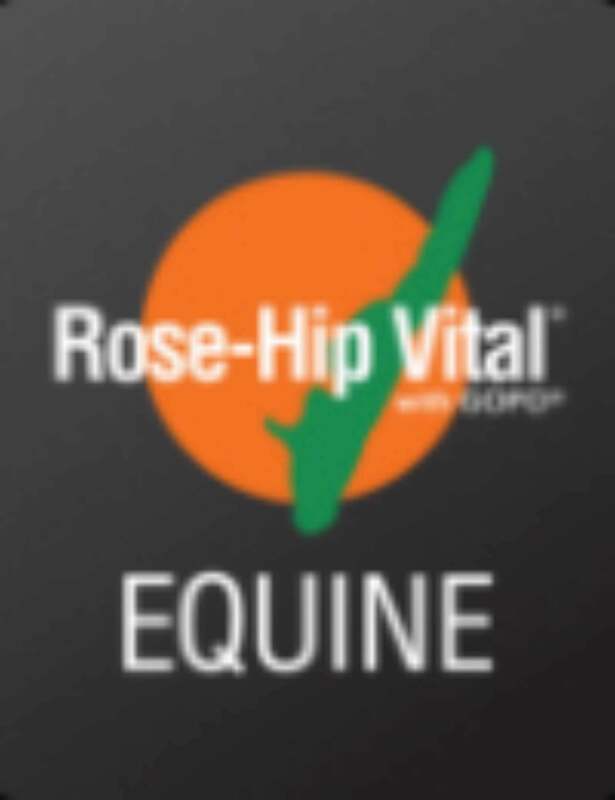 Rose Hip Vital has also given me a lot more energy and vitality and I am able to enjoy riding horses again. I feel over all incredible from using this product and I would highly recommend this product to anyone who have persistent Injuries. I just wanted to write in on behalf of my Mother in Law, to thank you for how much this product has helped her symptoms of arthritis. Before she started taking Rose Hip Vital, she could hardly move or turn her head without excruciating pain to the neck and shoulders. X-Rays had shown wearing of two of the cervical disks plus signs of Osteoarthritis. There was no solution other than a risky surgery or pain killers, both options which she did not wish to take. She started taking your product a few months ago on recommendation from a relative who was also taking it. She asked me whether I thought she should take it, as she was sceptical at the time, and also concerned about any possible interactions with her medications. After a bit of research, we decided to give it a go. What a change this product has made – my mother in law can now walk, sit, and do tasks without wincing. Her pain has reduced and she has even noticed improvements in her joint mobility since taking this product. We would recommend this product to anyone suffering from joint inflammation or arthritis, based on the results we have seen in a few months! I write you this letter to send my thanks to an amazing product! Rose-Hip Vital! I have been battling a lower back problem for years now, I have tried and tested many products that claim to work, but they haven’t given me as much success and in the short amount of time that your product has and continues to do. I have recommended many of friends and family to start using this product as the relief that it has given is fantastic. I am currently not using any pain killers or anti-inflammatory products at all, which is a miracle as at one stage I was living on them. I couldn’t get out of bed! I have recommended my daughter in law’s father to start trying this product, because he has been told by his doctor that he has osteo arthritis in his knees and to take 6 Panadol Osteo a day! I’m not a doctor but I’m sure your product will help him. I just have to tell you how delighted I am with your product Rose-Hip Vital. A few weeks ago (happy, happy day!) a pharmacist told me she knew of something that I would be able to take, a natural anti-inflammatory product which she had had many good reports about from her customers. This, of course, was Rose-Hip Vital. To my surprise after only ten days, I felt sure there was some improvement. As the weeks went by, I gradually dispensed with the drug doses, one by one, starting with the oxycontrin, then the Panadol. I just couldn’t believe it and started to feel so much better in myself. I think this was also helped by the fact that your product is high in Vitamin C which has always upset my stomach when taking tablets, but not with Rose-Hip Vital. Another plus! After the suggested three weeks of ten capsules per day, I now take the maintenance dose of five capsules. I feel as if I am still improving and what a difference it has made to my life. No more horrible pains in my feet, legs and back at night and therefore, much sounder sleep. I could go on and on! I think I am a much happier person and not so irritable. Today I realised that I had only taken two Osteo-Eze in 36 hours and that was after doing a fair bit of walking etc. The capsules of Rose-Hip Vital are very easy to swallow but I mustn’t forget the best thing. When I had my regular INR blood test for the first time after taking Rose-Hip Vital, I wondered how it would be – perfect reading! So what else can I say? Now I want to tell some of my many friends who suffer from arthritis. Just a brief note in favour of your product. I was a very heavy user of pain medication for many years since my accident in 1987. I have been taking nothing other than your pills for nearly 3 months now and do not even need Panadol. I have a major disc prolapsed in my back and wear a back brace while working, but now I only wear it as a reminder to be careful. My arthritis is a non event as well. I have now got many friends trying it as they have seen the changes in me. It is a great product and I wish you all the best. The changes it has made to me are amazing in that I can do a lot of normal things I could not do before due to the aches and pains. My carpal tunnel is a huge thing in my trade and very common. As a Pastry cook your hands are your job, as is my back. In theory, I am not meant to be able to be baking anymore. The Arthritis has not as yet been proven by a doctor but the crackling in the joints tells me that it is there. The pain in my back is just annoying now whereas before, it was the ruler of my life. If I had the money, I would love to see an MRI of any changes to my spine in 6 months of being on the Rose-Hip Vital. The world is a Bed of Roses on Rose-Hip Vital. Cheers, Roy. My 10 Rose-Hip Vital capsules per day finished now on the booster dose of 5 caps per day. Am I feeling the effects? Yes I am, very much so. A lot of my aches and pains from stiff joint syndrome and arthritis have eased and I am sure that with continued use will get even easier. Would I recommend this product? YOU BET I WILL. Knees and lower back are so much more comfortable in such a short time. I was worried it would affect my blood glucose levels, but there are no worries in that area. With continued use, I hope to be much more flexible in the joints. Thank you Rose-Hip Vital for allowing me to test your product, you now have a regular customer who would dare not be without it now. I am indeed very happy. My name is Adam, I am 52 years old I have tried every arthritis pill on the market with no result but when I tried Rose-Hip Vital 250 capsules my knees and ankles and back felt some relief. I thank you so much for this product it really works. I was in pain 24-7. Thank you so much. I am 64 years of age and had been diagnosed with arthritis in my spine as well as fibromyalgia. I was having great difficulty doing just regular housework and even walking around the shops was becoming a painful chore. Whenever there was a change in the weather, I knew that my pain levels would increase dramatically and that I would need to put a stop to doing anything for that day. I had various problems including neck problems which required surgery, various episodes of shoulder bursitis, heel spurs and I was starting to feel that I was very old and unable to manage or enjoy my life anymore. I first came across Rose-Hip Vital on Facebook and I looked at how everyone had written to say how much Rose-Hip Vital helped them. The very next day, I went to my local Chemist Warehouse, bought my first jar and started the recommended dose. Three weeks later, I slowly decreased my dose until I was down to 5 a day and it was not until about a week later that I suddenly realised that I hadn’t been reaching for any of my pain tablets. The pain has decreased to a very low level, where now I can manage to do most things around the house. Walking is a joy again and life is good! Thank you Rose-Hip Vital, you are amazing. I am six days post-op’ from lumbar pedicle screw fusion of discs L5/S1 of my spine. I was discharged yesterday, way ahead of schedule. My surgery lasted eight hours and I was up walking the morning after. I was unable to have high end drugs such as pethadine, morphine etc. as these types of drugs block important ‘something is not right’ signs such as tingling and numbness, so was in quite excruciating pain. Despite the exruciating pain, I credit Rose-Hip Vital with making me ‘surgery fit’ as for a few months up until one week prior to surgery, these were all I was taking. These capsules have given me the quality of life I’d not had in years prior. I was sent home with all the drugs one can imagine, such as endone, brufen, panadeine forte just to name a few but today I’ve only had two panadeine and six Rosehip and feel so well under the circumstances.. I’ve said it before but Rose-Hip Vital is AMAZING. Hi Rose-Hip Vital fans, my name is Klara. I’ve had amazing results with Rose-Hip Vital and wanted to share my great news with all of you too. 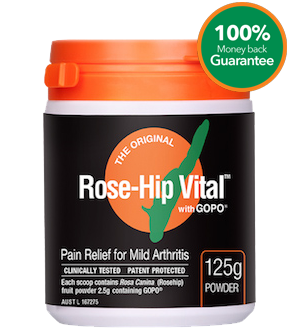 I’ve been using Rose-Hip Vital with GOPO myself for around 2 years continuously now after watching an ad on T.V. I have long been suffering with lower back pain (arthritic) and in general, as well as knee/joint pain for most of my adult life. Most of this pain is a result of a car accident as a teenager. The pain is debilitating and my quality of life was affected greatly. I started using Rose-Hip Vital and within about a week, I was amazed at the relief I was getting. I knew it was no coincidence as I had been prescribed a very strong narcotic for the pain and had been using that for nearly 10 years with relief being less and less. I now use this product and tell my family and friends because after suffering with this type of pain with no real break from it, finding the Rose-Hip Vital has absolutely changed my life!.. Pharmaceutical anti-inflammatories aren’t an option long term as they thin the blood, which can cause some very severe side effects. Please bear with me a little longer, as the news gets better. Myself alone can’t express how great these products are, and if you have arthritis or back pain, you will know how awesome it is to to not suffer. I do not hardly suffer at all anymore, so this is a miracle.